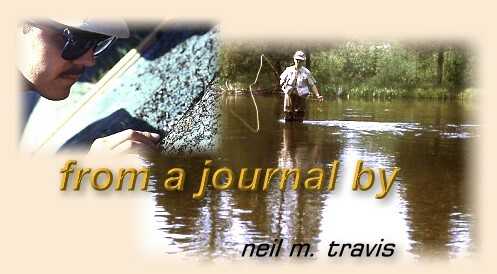 It is likely there are many modern fly fishers who have never heard of the Neversink Skater. It is equally likely they have never heard of the Neversink River or Edward Ringwood Hewitt, the dean of the Neversink River. Edward Ringwood Hewitt [1866-1956] wrote several important books about fly-fishing including Better Trout Streams, which was a book that outlined his theories for stream management. Hewitt was the dean of the Neversink River, a Catskill stream where he maintained a fishing camp. Both Hewitt and his fishing camp on the Neversink are gone, buried under the backwaters of the Neversink Reservoir that was built to supply water for New York City. Hewitt had a reputation as a technician and a creative thinker, and one of his inventions was the Neversink Skater. Those who knew him described him as a somewhat taciturn individual with a blunt and direct approach to everything. The Neversink Skater was originally tied, according to a written account authored by Mr. Hewitt, to imitate butterflies that he saw fluttering over his water on the Neversink. Whatever the fly actually imitated it was quite successful under the proper conditions. The Neversink Skater is a big fly. Tied on a size 16 hook it is fully two inches in diameter when properly tied. What makes the Neversink Skater unique is the way it was tied, and like many 'old school' fly fishermen Mr. Hewitt would not reveal exactly how it was tied. A properly tied Neversink Skater consists of two hackles tied facing each other so that the hackle tips form a knifelike edge all around the perimeter of the fly. Vince Marinaro described it as "two saucers brought together, with the hollow sides facing one another." While Mr. Hewitt was alive he was the sole source of supply for these flies. Many people tried to figure out exactly how Hewitt tied these flies, but to my knowledge only one man ever successfully unraveled the mystery. The Neversink Skater intrigued my old friend Vince Marinaro, and although the fly seemed to be nothing more than two large hackles tied with the dull sides facing each other, to get the right effect baffled professionals and amateurs alike. The hackles had to come together with a knifelike edge otherwise the fly would not perform correctly. Vince took one of Hewitt's skaters and cut it apart with a razor blade over a sheet of white paper, and after examining the debris for several days he uncovered the secret of tying the fly. Since Hewitt was a personal friend Vince decided not to reveal the secret until after he was dead. In 1976 Vince wrote an article in Outdoor Life magazine where he related the complete story about the Neversink Skater and exactly how to tie it. He had previously related to JC and me the secret upon the promise that we would not reveal it. Note: For more on the Neversink Skater click HERE.